Set on the 15,000-acre Puntacana Resort & Club land, with 3 miles of white-sand beaches and 2 nearby championship golf courses, The Westin Puntacana Resort & Club delivers the ultimate Dominican Republic golfing escape in the bliss town of Puntacana. The list of activities doesn't end there, with a wide range of water activities, a shopping village all on top of world-class restaurants. The 2 championship courses nearby to the resort, La Cana Golf Club and Corales Golf Club, boast unbelievable coastline views with spectacular backdrops. Also, Corales Golf Club has been recognised for its quality, hosting a PGA Tour event in 2018. Known now as La Cana, the result is an awe-inspiring 7,152 yards of innovative championship golf, opened in 2001. No less than 12 holes provide incredible views of the Caribbean Sea, and much to Dye's credit, the holes are a match for their astonishing surroundings. The designer's trademark pot bunkers are littered throughout La Cana, nowhere more notably than the 7th hole, which has a cluster of 21! The course is as spectacular as the resort itself, so there is no doubt that Dye has succeeded in establishing Punta Cana as one of the world's leading luxury golf resorts. 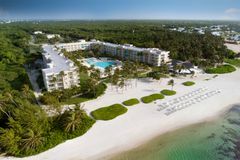 The Punta Cana Resort and Club is perched on the edges of a 3 mile stretch of unspoiled beaches, gently washed by the warm turquoise water of the Caribbean. The resort's intimate ambience is a result of its low density formation, providing the privacy and isolation that is at the heart of a perfect Caribbean escape. The deluxe accommodation comprises options to satisfy every demand, all with easy access to the delights of Punta Cana. The hotel's Junior and Deluxe Suites provide either sea or garden views, and are beautifully appointed in fine mahogany furniture. Simple island elegance is the overwhelming style in the suites, which are well equipped with every necessary amenity required of a first class property. The Deluxe Rooms are located in three-storey buildings, offering easy access to the beach, and boast ocean or garden view rooms embellished with private balconies. For added privacy, larger groups and families are best suited to the two/three bedroom Beach Casitas, which, in addition to being superbly appointed, are complete with a separate living area, dining room, and a garden or terrace to while away the sun-drenched early evenings. Scuba diving is a certain highlight at Punta Cana, where the centre is recognised as a Gold Palm Resort - the excursions for certified include one to a sunken ship. Sailing, windsurfing, kayaking and snorkelling are among the water sports free to resort guests, who can also go horse back riding at El Rancho, play tennis on the six clay courts, or bathe in the healing mineral-rich waters of Manantial Yauya, a crystalline spring in the resort's ecological reserve. Of the six bars at Punta Cana, a personal favourite is the Bamboo Bar, where the best local rum is paired with hand-rolled Dominican cigars. The Bamboo Restaurant's interior was designed by famed designer Oscar de la Renta, while La Choza Surf & Turf combines succulent steak with the freshest local seafood. The deluxe Punta Cana development also features a great kids club, called the Children's Carousel, and its own shopping centre.